The 3-1 favorite Tapiture currently holds the most Kentucky Derby leader board points out of all the Southwest Stakes contenders with twelve points. 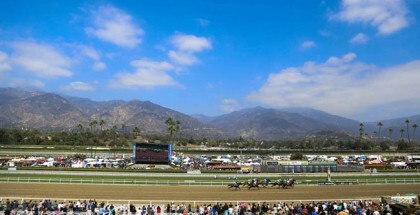 The 2014 Southwest Stakes takes place Monday, February 17th and will award the first place finisher ten points on the Derby Trail. The GIII 1 1/16 miles Southwest Stakes for three-year-olds calls twelve contenders to the Oaklawn Park field including 2-1 morning line favorite Strong Mandate who is trained by D. Wayne Lukas and owned by Robert Baker and William Mack. Strong Mandate will break from post position #8 with jockey Joel Rosario on the mount. Last out, Strong Mandate finished third in the 2013 Breeders’ Cup Juvenile behind New Year’s Day and Havana. Strong Mandate has won a total of two races out of five including the Saratoga Hopeful Stakes back in September of 2013. 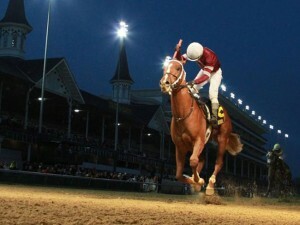 The Tiznow-Clear Mandate, by Deputy Minister colt ranked in the 2nd Kentucky Derby Future Wager 17-1 odds. Strong Mandate is currently in the 31st leader board position with a total of two points for his Breeders’ Cup Juvenile 3rd place finish. Second morning line favorite 3-1 Tapiture, who is in 4th place on the Kentucky Derby leader board with 12 points, will break from the rail with regular jockey Ricardo Santana, Jr. in the 2014 Southwest Stakes. 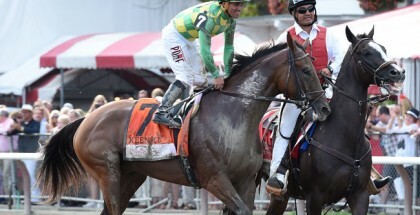 Last out, Tapiture and Santana won the Kentucky Jockey Club Stakes for trainer Steve Asmussen. Tanzanite Cat, with surprising 8-1 morning line odds, will break with jockey Corey Nakatani from post position #3 in the 2014 Southwest Stakes. The Cody Autrey trained three-year-old won the Smarty Jones Stakes at Oaklawn Park on January 20th, earning the colt ten points on the Kentucky Derby leader board. Tanzanite Cat is currently in the 15th place position on the Kentucky Derby leader board. Also on the Oaklawn Park field on Monday is Coastline, with 8-1 morning line odds in the 2014 Southwest Stakes and currently holds two points on the Kentucky Derby leader board and is in the 33rd position. Walt owns 4 points and is in 23rd place while Ride On Curlin, who teams up with jockey Calvin Borel for the Southwest Stakes, has three points and is in the 30th Derby leader board position. Jockey Ramon Vasquez teams up with 15-1 Bourbonize for the 2014 Southwest Stakes. Owned by Bourbon Lane Stable and trained by Kellyn Gorder, Bourbonize is currently two-for-two in his racing career. Last out the colt won by a solid four lengths in an allowance race at Oaklawn Park. Boubonize doesn’t currently hold any Kentucky Derby leader board points but the gelding is worthy of mentioning in the 2014 Southwest Stakes because insiders claim he will surprise us by keeping up with the stellar competition at Oaklawn Park. The 2014 Southwest Stakes at Oaklawn Park takes place on Monday, February 17th with a 5:09 PM CST post time.